Waffles and LJ returned to normal form in Mookie last night. It was BEAUTIFUL from a prop bet standpoint! 1st RaisingCayne trapped waffles TWICE then LJ demonstrated all aspects of her game (suckoutistry, aggression, cardrackery) leaving a string of kills not seen since the governator in Commando on her way to victory. Mad props to LJ for showing waffles how not to be the final loser in a tourney. Demon daughter (nickname coined by IT) wanted to watch America's Got Talent. Seeing Derrick Barry perform in school girl outfit was a bit over the top IMHO. Wife walked into room and commented "she sounds good and is cuter than Britney", to convey information quickly I responded "he's cuter than Britney". Demon daughter was left confused by this and a long (and amusing discussion ensued between wife and daughter). Waffles rubs one out after watching clip is 8:5. Tomorrow for the 1st time in 2 years I have to wake up at 7:00 am!! I am sure a lot of you are not sympathetic but I have grown quite accustomed to waking up later and rolling into work at 9ish. Worst part is that my wife may grow accustomed to me dropping the kid off and want this to continue when she is allowed to drive again. This means no more DS PLO at 0045, no more Turbo Fiddy at 0100 on a school night. Mr Bodog seems to have given up on Bodog, that was enough for me to request a check. 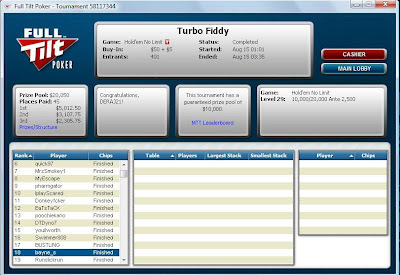 My deepest run in a tourney this weekend was in a WCOOP ME sat. 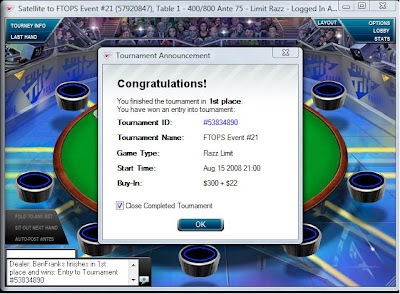 Top 19 got seats, 20-32 got $320, 33rd got $240. Had 3 hours of solid play sitting with 30th of 40 stacks. I was playing a step 1 where 3 handed I call a shove from BB with AA, Sb had 50 more chips than I and A6s and rivered a flush. I reacted by shoving 11 BBs with KQo UTG + 1 in ME sat and lost to the AKo that naturally called from MP. I took the 77 limp calling a shove and cracking my KK much better 12 hands prior in ME sat because I at least had satisfaction of watching that donkey get AA cracked after limping pre a little later. I was thinking as I watched two wet women embracing as they rolled around in sand will Kerri or Misty be this generation's version of Ginger or MarAnne? The I ran across this hilarious article that brought tears to my eyes. My apologies to my blog reader's that are offended that I have contributed to Satan's work. Being the engineer I am I had to break down Sunday's hand a little further to examine the case for folding AA. Telefonkiosk folds leaving him 3635 chips. This will leave telefonkiosk as shorty, if we assume from chip counts he is 50% to outlast xxxx_kev then assign 27% SEAT. This is ugly estimate but will for sake of math assign 33% chance of emerging in top 3 given 4th of 5 and 3 real short stacks. .33 x .27 = 9% SEAT. If this happens almost certain seat. Conclusion folding leads to seat 55% of time. Calling leads to Seat 61% of time. Conclusion knowing the hands is that calling with AA is slightly better decision than folding AA. Leading up to this hand Jorj95 is shoving a lot (which is his right as big stack), jorj having 2 random little cards inproves math for folding slightly and for calling slightly, jorj having KK improves math for folding significantly. This would seem to be a pick your poison case and question of whether you believe you can win seat against xxxx_kev would swing decision. If I am Telefonkiosk I think decision this time is fold. 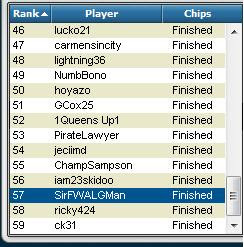 I started my $W quest with an $10.50 expenditure in a $5.50 rebuy to a WCOOP 6 satellite. So I continued into step 5. Late Night poker winding down. LJ : no turbo fiddy? LJ: wait r u in it? I was 3rd chip stack at break which obviously inhibits my roach game. Lost a couple of flips because blinds can't ever fold blackjack 20s and then jammed presto from CO into QQ to exit. 75 entrants in 0045 breaks previous high mark I've seen of 67. I doubled up early, was top 4 stack at break but with 15 left (9 paid) I assumed Dank position. 5 posts correcting Hoy hand histories. 10 with strategic poker ideas. 20 links to things I found amusing. 0 chronicling my sexual exploits (MiamiDon and Waffles) should remain source for those. 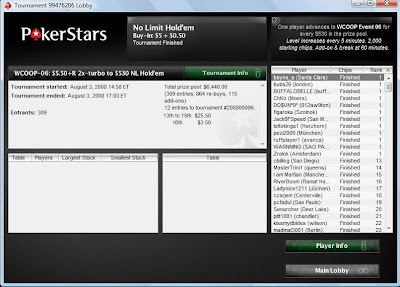 I took the Event 6 exit from the Poker Stars WCOOP Steps last night. 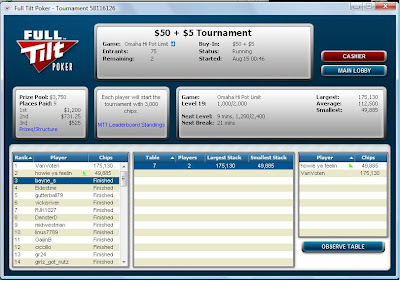 I am 2/2 cashing in Step 4 tickets for Event 6 seats. 2/12 converting Step 3 tickets to Step 4 tickets (but 7/12 at keeping step 3 tickets). My success rate gets progressively worse in Step 2s and Step 1s as play is worse but higher variance is introduced. Yes it was questionable but he flopped nut flush draw and oesd with 2 overs with A8s and amelhem raised jammed AQo unimproved on flop. There is so much poker wisdom shared in chat at a Step 1 that they should be played for educational value. While in Las Vegas I did place a $50 bet on Rams to win Super Bowl for me and $20 bet on Jets to win Super Bowl for VP (yes he is cheesehead). I will try hedging strategy that has been suggested by a known sports bettor if Rams make playoffs. Discussion of Rams hedge did lead me to hedge a craps Fire Bet this weekend. I had made a wtf $3 Firebet and Dan had already hit 4 unique points for 25:1 payoff. Once he rolled a 4 which was 5th unique point rather than backing up passline bet with odds I did $200 "lay" of 4. I was hammered so did not get hedge correct but if he hits 4 I collect ($750-$200) vs if he misses I get $100. A $500 lay would have guaranteed $250 profit and possibly a chance to hedge 6th number. I have no idea why I entered this. No way in hell I want to play Razz FTOPS. I am still tired from weekend and now too tilted to sleep. The incident from this weekend's trip that will be remembered longest occurred surprisingly enough at a craps table. A Las Vegas rookie was on the trip and played craps for 1st time. 1st time he rolled he scored me 8 place bets on 8 and 7 place bets on 6. But he has read the wizard and knows that don't pass is a slightly more favorable bet than pass and chose to bet Don't Pass when it was my turn to roll. I was a bit offended and reacted by making the UT "Hook em Horns" gesture at him and teling him "Mess with the Bull, get the Horns". My 1st roll was a 7. He bet Don't pass again. He heard "Mess with the Bull, get the Horns" and saw gesture again. He doubled his bet on Don't Pass. He heard "Mess with the Bull, get the Horns" and saw gesture again. Strangers at table were laughing and telling him to keep making me mad. He bet Don't pass again and got whiny about me trying to break him when I made so much money off him. Mess with the Bull, get the Horns" and saw gesture again. Sadly I rolled a 3. He bet his last $3 in chips on don't pass. Sadly I hit a bunch of numbers but failed in my quest to make the point and get last $3. Mookie is tonight, I anticipate an early waffles exit. I visited above site today and this story cracked me up. My favorite weekly tournament also got a little bit better! 5 former co-workers and I went to Las Vegas for weekend. Played Planet Hollywood's 2 pm Poker tourney. Took bottom cash when with blinds at 3k/6k UTG +1 shoved for 17k, shorty called for 2k and I called holding AQo with 20k behind and lost to KJo. 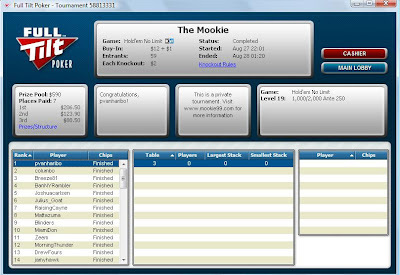 From 20 players down tourney was 1 move poker and I went card dead from 14 players left on. I did manage a couple of steals but no confrontations won to accumulate chips. I also gave Saturday Night Venetian a chance and played flawless poker IMHO. 1st three hands were reasonable pre-flop folds, 4th hand I reraised an EP raiser holding QQ. EP called my raise. 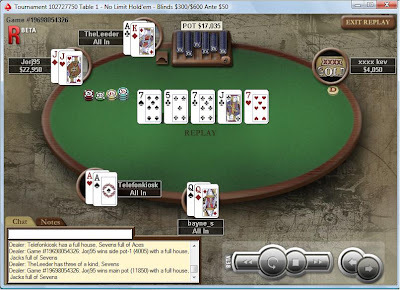 Flops was Q82 rainbow and I felt compelled to call all in after I was checkraised on the flop. AQs went runner runner flush and IGHN with more time for craps. Harrah's properties have moved to paying 6:5 on Blackjack in the low roller areas. IMHO the game is no longer blackjack, should be forced to be given a different name and tables should be avoided until 3:2 payoff is restored. Other observation is the prostitutes seemed more aggressive this year than in past. When we walked the strip they would jump in path of our group of 6 and each time blocked the path of Dave who ironically also would have most money being currently retired after a successful start-up. Either they smell the money or go after the smaller dude to avoid risk of me trampling while not fully paying attention. I also saw casino security removing pros from gaming areas a couple of times. Lesson from that is casinos don't like gambling to be impeded. Had another couple of beats with KK in tournaments, 1st to QQ on rivered Qnd flop was KQ9, turn T river J.
I will be offline a couple of days for a quick Vegas trip. Have a good weekend! Sorry Wife of Dr. Chako. 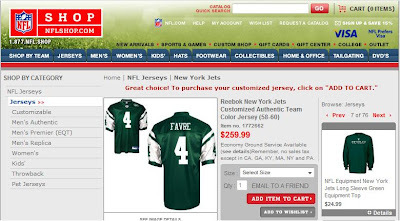 We may have to have a prop bet on Sept. 28th game with a jersey wearing on the line! I will certainly play tonight. I could certainly find a flight to Philadelphia and way to continue to Atlantic City if I win. I can't conceive of being able to go as work is already being very accomodating about me having to be driver to take kid to/from school until wife's driving priveleges are restored and can't justify kid not going to school so if I get heads up I will be dumping chips. Sadly driving duties will force me to miss WCOOP 16 and WCOOP 30 as well. I was goofing around and entered a $5 Rebuy WCOOP sat, I don't think I lost a race during monkey hour and amassed a top 15 stack for an $11 outlay. 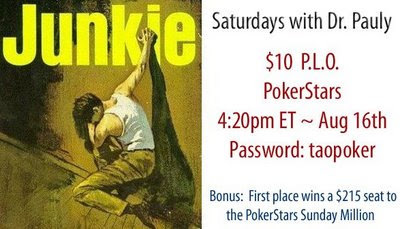 Sadly I look through Pokerstars WCOOP schedule and realize with it's 11:30 am and 1:30 pm Pacific start times I would have to take a day off to play a non-weekend event. To play a weekend event I am going to need a lot of $W or to learn new games. 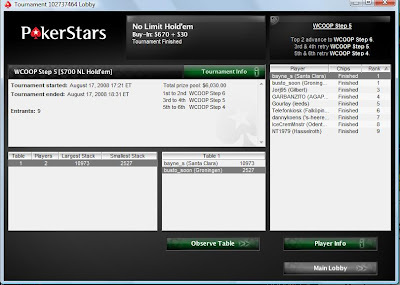 WCOOP 6 would be playable if I assume that I have cashed if I make day 2. This would mean I have to run my $530 $W upp to $2100 $W to play 3 events I'd like. 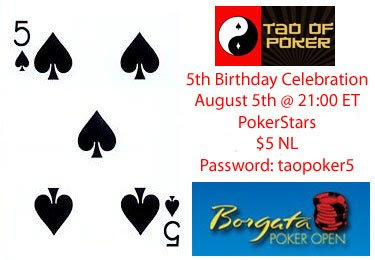 I am still suffering some post BBT blogger tourney burnout but may show up especially since next week is definite miss for Las Vegas. Played my live poker tourney in Morgan Hill only to be crippled by Right Wing Owen Nolan calling off all his chips with an A rag, if only I knew how many penalty minutes he averaged I might have been comfortable calling him a donkey. The maps for Page 2 polls are always interesting. When the question is who will win next golf tournament Tiger Woods or Field? 49 states choose Tiger, Nevada always chooses field. Today's Manny legacy poll is interesting because as big a goofball as Manny is I have to believe the Massachusett respondents got it right. Over his career Manny averages 39 doubles, 40 HomeRuns and 130 RBIs a season. Albert Pujols has got to be the only right handed hitter more feared in majors today and he has been doing it half as long. If wagering were available I would wager that Scott Boras orchestrated most of this in order to get paid. It will be interesting to see how much the Cubs, Mets or even Yankees shell out to add Manny to lineup next season. It is a sad day in Red Sox nation when Manny has to go because he has quit on team.